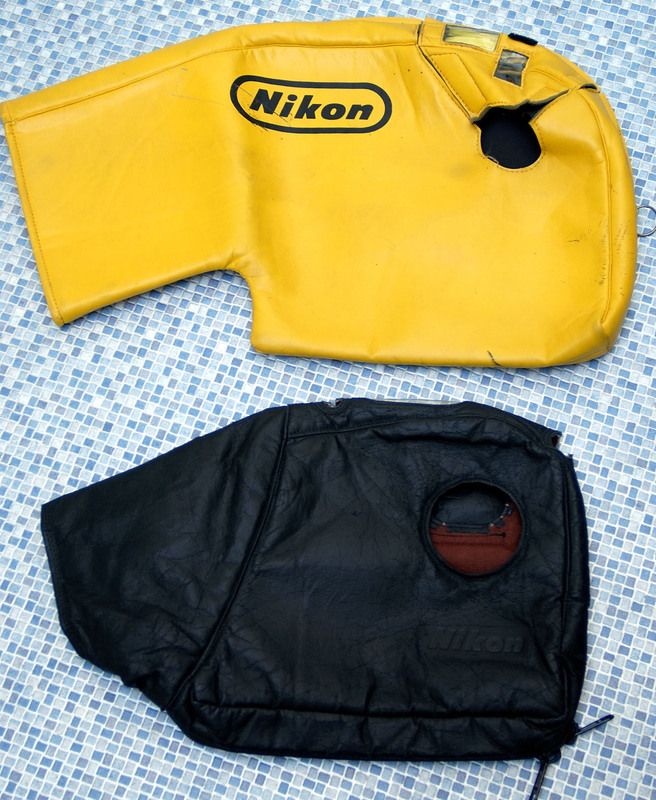 Nikon made various bags and other protective materials available for nearly all their cameras, lenses and other gear. A very nice web site gives a comprehensive overview of most interesting bags for Nikon rangefinder and early Nikon film cameras. The bags for the rangefinder cameras, lenses and accessories do not have a product code. Most of them are made from brown leather (see above - including a rain protector). Bags for the SLR cameras and lenses do have a code - two letters and a number. The camera bags have a code like CF, CH and CS (soft bags), CS-L are bags for compact cameras, shoulder bags have a CB code, bags for large equipment have FB code, flashes have bags with a SS code, bags/boxes for filters have a CA or CP code, lens bags have a CE and/or CL code. Long lenses can be stored in a trunk with a CT and/or CZ code. For movie cameras like the Nikon R8 and R10 there is an EH-1 and EF bag. Most bags for SLR cameras can be ordered with a different front to accommodate a camera with a longer lens. Have a look into your the manual of your Nikon product to find the right code. 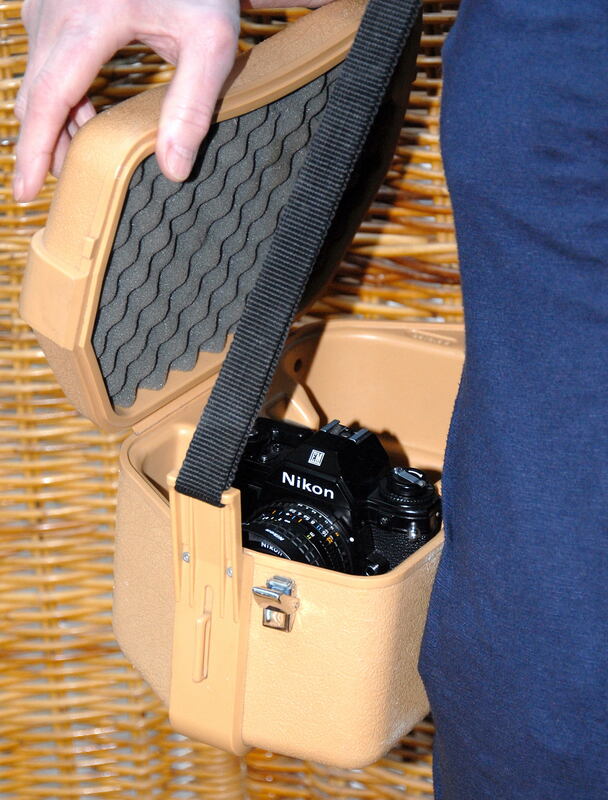 An unique bag is the Nikon FB-E, specially made for the Nikon EM: a plastic 'beauty case' holding a set of one camera body, some lenses and a flash (SB-E). A blimp is a cover for a camera with lens (and sometimes other accessories mounted) to reduce noise and/or to protect the set against tough work, rain or cold. 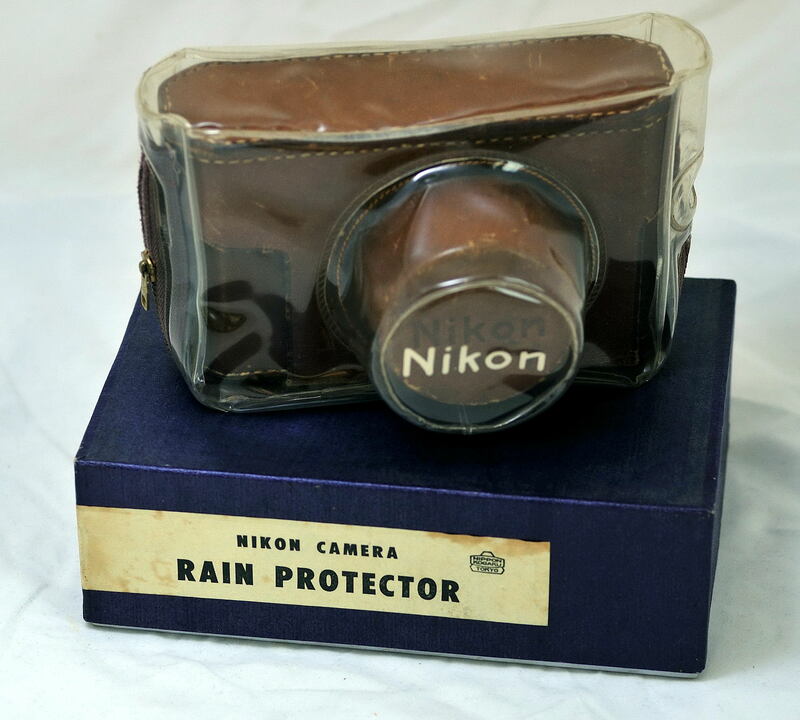 For the Nikon F a small blimp (see below) was produced. At right some open space is left for the Photomic viewfinder. This item is rather rare. The Nikon CS-13 black blimp (see below) is the most known blimp for nearly all SLR cameras, even when a motor drive is mounted. It is for right handed photographers only. The yellow blimp was given to photographers at the 1980 Olympic Winter Games in Lake Placid (USA).